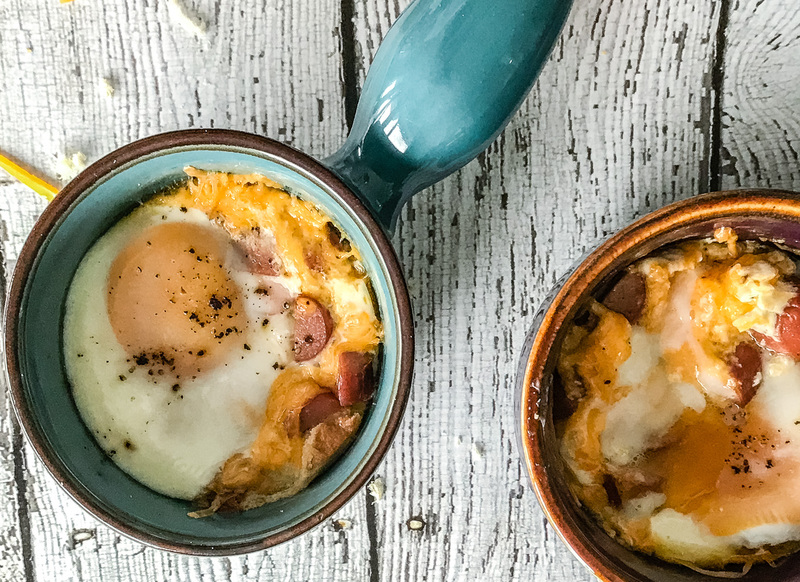 This Cheesy Oeufs en Cocotte recipe is the quick-but-fancy breakfast recipe you’ve been waiting for – baked eggs with cream, melted cheese, sausages, and built-in toast. You heard me, bestie. Built. In. You may have heard this recipe called shirred eggs, oven baked eggs, or eggs in pots. What’s important is, this is delicious, and you can probably have it ready in less than 30 minutes! 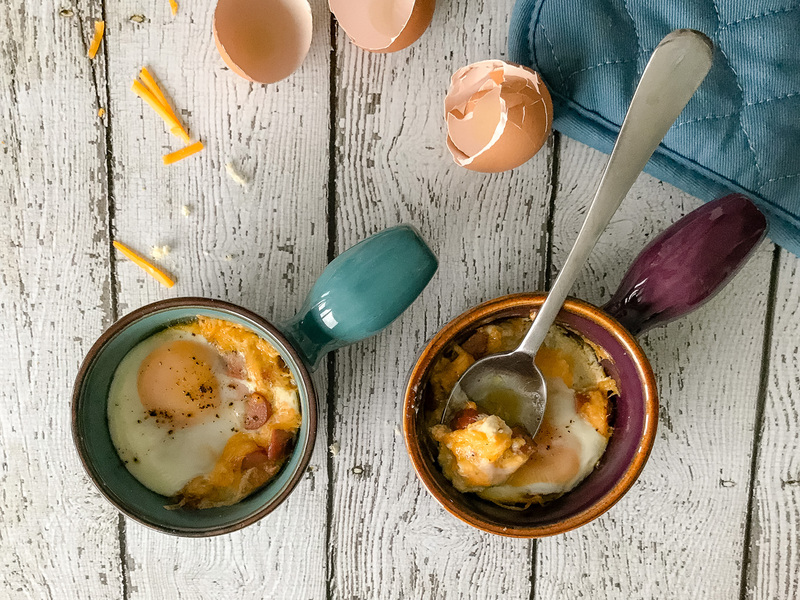 Oeufs en Cocotte is one of those breakfast dishes that people seem to completely forget about…that is, until they try it, and remind themselves of what it is they’re missing. And this cheesy version of the classic dish really just takes it to another level. I wouldn’t be exaggerating if I told you that this is the type of dish you can easily become obsessed with. A cocotte is a round baking dish that typically has little handles on its sides; very similar to a Dutch oven. The word itself can be translated from French to mean “pot” or “casserole dish”. It can also refer to hens or chicks, or even a term of endearment. But that’s not what we’re talking about today ma dear cocotte (see what I did there? ), we’re talking about the cocotte as it relates to oeufs en cocottes. And in this case, what we’re really referring to is a mini cocotte. Now, don’t worry if you don’t happen to have a few mini cocottes sitting around your kitchen. 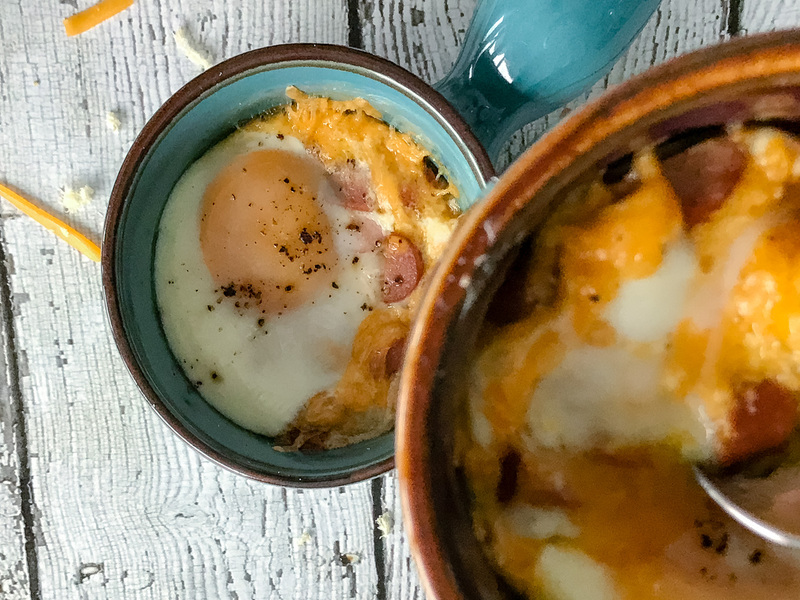 You can make these eggs using good ol’ fashioned ovenproof ramekins. Actually, I don’t own mini cocottes either so what you seen in the pictures and video below are actually a pair of French Onion Soup bowls. Oeufs en cocotte are cooked in mini cocottes (or ramekins) and are baked in a bain-marie. Shirred eggs are traditionally cooked in a flat-bottomed shirrer without a bain-marie. I’ve heard both variations referred to as “eggs in pots” (I love that, so adorable!) or “baked eggs” (less adorable, less love, still delicious). It makes you look like a fancy French chef in front of your friends. It’s a lot easier than most egg dishes. It doesn’t need the technical mastery of an omelette. Nor the finicky hollandaise of an eggs Benedict. It’s an adaptable recipe that you can easily customise however you like. You can have it ready in less than 30 minutes. Oh, and hey! While we’re speaking about omelettes, have you checked out my Mushroom Omelette with Chevre, Cherry Tomatoes, and Sausage yet? Heads up! The following are affiliate links. If you buy something through one of these links, I will receive a small commission. You won’t need to pay a penny more, but it’ll help keep my lights on! Thank you, bestie. You’re the best! Le Creuset Set of 4 Mini Cocottes (with Cookbook) – You can’t go wrong with Le Creuset, they’re a bit pricier than some brands but they’ll last your entire lifetime! Rachel Khoo’s The Little Paris Kitchen – this is one of my favourite cookbooks ever. Bellemain 4oz Porcelain Ramekins – If you don’t want to invest in a cocotte, these ramekins make for a great substitute! As for the Cheesy Oeufs en Cocotte video below – it’s actually the first video I ever shot and/or edited (so you can assume in advance that it is quite terrible). I considered omitting the video entirely, but I’ve decided to upload it in the hopes that (despite it being very unpolished), it shows how quick and easy this recipe really is! Also, let’s laugh about it later, bestie. 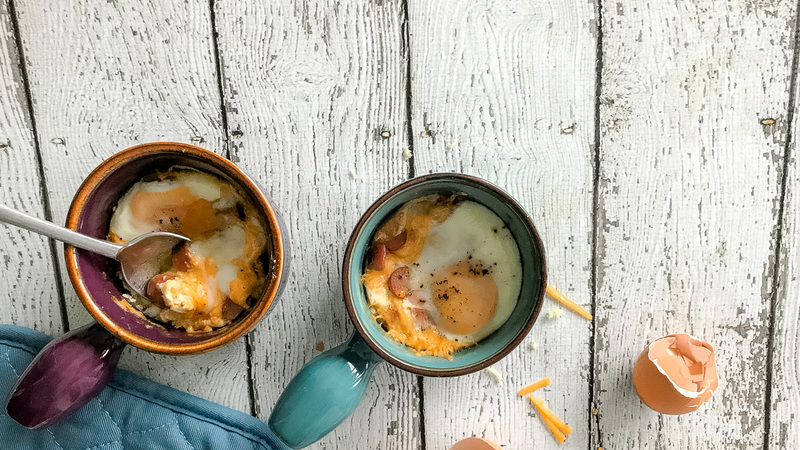 Isn’t there just something warm and cosy about the idea of baked eggs? I want to know what you think, and how you like your oeufs en cocotte. Comment below, tell me all about it. And if you want to hear from me more often, follow me on Facebook, Pinterest, Instagram and Twitter. Or just sign up to be a part of my mailing list. That way you’ll hear from me whenever I have an update! You also just leave an oven mitt, egg shells, and grated cheese casually on your tables once you’re done cooking. Right, bestie? Oh…just me? That’s okay, I’ll see myself out. This Cheesy Oeufs en Cocotte recipe is a super-simple but audaciously tasty dish. You can mix it up in a 1,000 different ways, and it’ll taste great every time. Place a slice of brioche in each ramekin. Toss in the cheese and chopped sausage. Crack an egg into each ramekin. Pour two tablespoons of cream into each ramekin (it doesn’t matter if it’s on top of the yolk). Optional: Add a heaped tablespoon of table cream to the bottom of each ramekin for extra indulgence. Pro Tip: Butter your ramekins before you start please! It just makes washing up that much quicker. Aww, thank you Diane! I like the sound of “classy and stylish” !!! Rizwan! I loooove this recipe! First of all I’m all about eggs. I could eat them every friggin’ day. 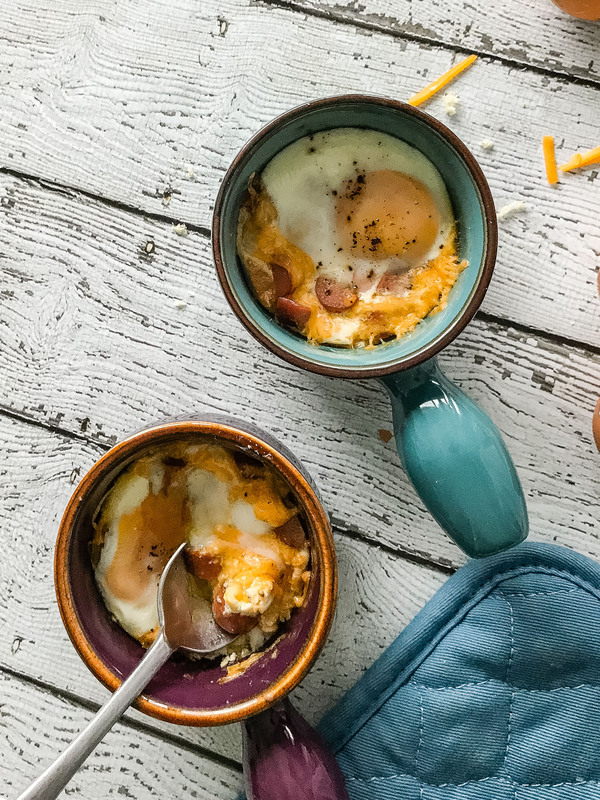 Toss’em into cute little pots with all of the breakfast essentials for a personal little brekky casserole? Hell. Yes. Thanks so much Dana! I love saying COCOTTE too (especially when I say it with an exaggerated French accent…but really, is there any other way?)! 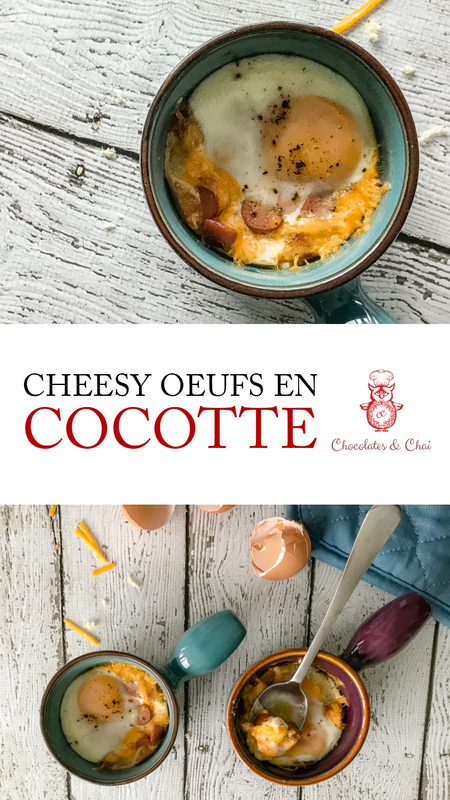 So many good reasons to in fact do Oeufs en cocotte and your beautiful pictures are definitely convincing! Your petite cocotte are adorable, Riz! I agree that this is a wonderful dish to prepare which impresses guests without too many details and technique on the part of the host with excellent results. Awesome! Thanks so much Denise! It’s one of my favourite breakfast recipes! I love how simple yet fancy this recipe is! Wow and I didn’t even know it existed. 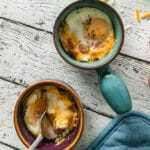 It is everything I love – eggs, cheesy goodness and sausages – yum! I’ll be doing some fancy french impressing soon! Hey Terri! 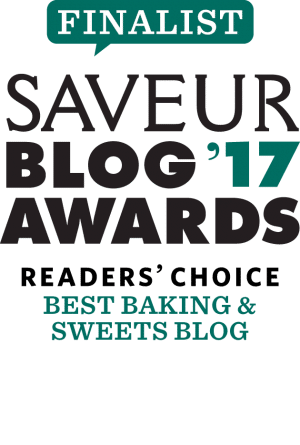 I agree – it has all my breakfast favourites all packed into one little cocotte! Happy impressing! Yes! Riz! Yes! This is exactly the kind of recipe I want to make this weekend!!! Yes! Joanne! I hope you make it this weekend! And enjoy it too! A friend of mine in Vermont (I’m in Woodbridge) recommended checking out your blog. So far, it hasn’t disappointed. I just made this recipe and it was really delicious. Will make again. Hey there! Thanks so much for visiting, and I hope you pass by again! I’m glad your enjoyed the Oeufs en Cocotte recipe! I just made this with my kids. We loved it! They say they’re going to make it for their dad tomorrow! That’s amazing to hear Sandra! I hope dad enjoyed it too!